Disclaimer: I traveled to The Running Event and received products products from Addaday, Altra, Arcanum, Brooks, CEP, Handful, Incrediwear, Nuun, Vooray, Vuori and Zwift as part of being a BibRave Pro. Learn more about becoming a BibRave Pro (ambassador), and check out BibRave.com to review find and write race reviews! I have reviewed Aftershokz, Buff Multifunctional Headwear, and Orange Mud in the past but the products featured in this post are my own. Still have Christmas dinner 2.0 with the “other” side of the family? What about that Saturday morning run buddy who surprised you with a gift and the gift that you, of course, already bought them is conveniently delayed in USPS due to government shutdown? Maybe you just think anytime between December 20th and 31st is an acceptable range for gift-giving? In any case, here’s the second part of my 2019 runners gift list! If you haven’t already realized. from several blog posts (merino wool, UV full, UV half, UV reflective half, UV arm sleeves, ThermoNet)and many pics on social media, Buff(R) multifunctional headwear makes up an entire drawer of my wardrobe both for daily wear and fitness must-haves. I use Buff headwear for casual outfits, bad hair days, travel, camping, running, biking, etc. I really love by BibRave branded BUFF original as well as the knit winter hat. Buff products are lightweight, easy to clean, versatile, and look great! My husband and I have been using Nuun Hydration for years, with tubes of it stashed all over the house, both cars, and numerous gym bags. Nuun contains the optimal blend of electrolytes in a fizzy table that transports easily, comes in many flavors, most of which are super tasty and not too overpowering, and some of which contain caffeine (pro tip: Nuun canisters with a colored cap have caffeine). In Atlanta in the summer it’s especially important to keep well hydrated and a good electrolyte balance since the heat and humidity catches up with you fast, even on recovery days. I find that keeping Nuun with me everyday encourages me to drink more water since it’s much more tasty. I’m really loving 2 newer Nuun products: Nuun Vitamins and Nuun Immunity. Nuun Vitamins contain 11 vitamins and minerals and less electrolytes than their standard hydration product so it’s a great way to drink Nuun every day. From the website, “each hydration vitamin supplement has only 10 calories and delivers vitamin a, folic acid and b6, c, e, and d for health and wellness, and sodium, potassium, calcium, magnesium, and chloride for optimal hydration.” The Blueberry Pomegranate is amazing and the Blackberry Citrus with caffeine is a great way to start the day with hydration rather than drinking only coffee, a diuretic. I’m starting each day with Nuun Vitamins before I drink coffee and it’s been a great way to rehydrate after sleep and I have more energy throughout the morning. Nuun Immunity uses “a balance of anti-inflammatories (including turmeric & ginger), free-radical fighting antioxidants (such as elderberry & echinacea), and the hydration-optimized blend of electrolytes” to help support immune health. I’ve been using Nuun Immunity for my afternoon Nuun fix. Even better, we found out at The Running Even that Nuun can be served hot as a tea! I’ve been using the Citrus Orange Immunity or the Ginger Lemonade Nuun Vitamins for an afternoon/evening hot tea! Mmmm. I discovered Orange Mud years ago when I started using their transition towel (I now own more than 4 with at least one in each car at any time). A year or so later I had the opportunity to test the Hydraquiver Single Barrel as a BibRave Pro, followed by the Endurance Pack, and Gear Vest. A section of my closet is full of additional Orange Mud purchases and I’ve spread the love to friends and family as well. The VP1 is my go-to pack for the majority of runs up to half marathon or a well-supported road marathon. The VP2 or endurance pack are great for longer runs (with the endurance pack great for off-road cycling as well), especially longer trail races where aid stations are farther apart. 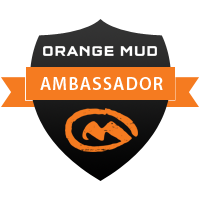 Founder/Owner Josh Sprague is passionate about his products as well as the growing community of Orange Mud users worldwide. He constantly asks for user input, puts a lot of thought into the quality of materials and manufacturing, and the company as a whole has amazing customer service. Rocking the Hydraquiver single barrel at Ironman Chattanooga 2016! I’ve always seen the colorful blue Addaday products at race expos and local running stores but hadn’t yet pulled the trigger on purchasing yet another torture device since I still wasn’t happy with the products I already owned. We received the Addaday Pro Type C roller in our swag bag at The Running Event. The Type C is a great recovery tool that includes blue and grey rollers for helping to flush out lactic acid and muscle fatigue. A smaller red pin point muscle roller is great for those hard to reach spots, such as Achilles and shin splints. I found this recovery stick great for after hard workouts as well as during our long road trip from Atlanta to NH for the holidays; I used it in the back seat so I didn’t get as stiff from sitting in the car all day. It worked wonders and I arrived in NH ready for many adventures! The stick itself is made from high quality material that doesn’t wear down. It’s also meant to make self-massage easy so you can use it standing up, sitting at a desk, wherever without having to get on the ground and fiddle around like with a foam roller. The Addaday Pro Type C roller retails for $42. We also learned at the Running Event expo that Addaday is moving into a more whole wellness space so they’re beginning to offer a more diverse array of products geared toward general wellness. In fact, at the expo they debuted their latest product – Runners Tea! The tea is made from whole tea leaves and can be steeped up to 5-6 times, hot or cold. It had a really nice light taste, like a light green tea, so it gives you the caffeine without the acidity of coffee. A tin with 10 5oz packets retails for $25. If you have an awesome spouse like me you can sip your tea while they use the Type C roller on your calves. Hurts so good! This compact backpack came chock full of all the other awesome goodies we received at The Running Event Influencer Day. I especially loved the bag for traveling home since I was still able to carry everything on the plane even though I was returning with twice the amount of gear I arrived with. The bag has 2 exterior water bottle pockets, a padded 15″ laptop compartment, an interior meshed zipped pocket that’s great for smaller electronics and cords, and an exterior pocket that I used for any quick-grab items, such as phone, wallet, and lip balm. I used the ACE backpack more recently for a ski trip where it easily carried all my gear including: helmet, goggles, gloves, pants, jacket, change of clothes, socks, etc. I also used it for bike commuting and added some spare strips of Brilliant Reflective stick-ons for added safety! When we visited the Vooray booth at The Running Event expo I was so impressed with the quality of all their products and the amazing price points. Looking at and handling all their gorgeous bags, it would have been easy to think they were worth 2-3 times as much, but the ACE backpack retails for only $39.99! The kind Vooray folks also let us grab some free active fanny packs. The fanny packs also come in fun prints, have welded waterproof zippers, water resistant nylon body, and a headphone port (for those of you still tied to cords). I have always hated wearing waist packs because they bounce around and shift; not so with the Vooray fanny pack! I used this in a very very wet 10 mile race in Atlanta for stashing my phone, some cash, and some nutrition. Everything stayed bone dry and the bag didn’t bounce or shift. All for $19.99. Amazing! If you check out their website now, there are items on clearance for up to 50% off so you can really grab some amazing deals. Rounding out the Vooray awesomeness, I arrived home from holiday travels to an awesome gift from my BibRave secret santa: the Vooray cinch backpack and coach cap, perfect for future travels! This entry was posted in Product Reviews and tagged addadaybr, bibchat, bibravepro, buffbr, holidays, nuunbr, OrangeMud, trebr, vooraybr, zwiftbr. Bookmark the permalink.